did you try pumping the brightest areas with the levels control in photoshop to bring out more detail? I guess its static electricity. Interesting picture despite poor lighting, however it doesn't immediately give me a feeling of stopped motion as many others do. More! I want to see more color and more waves. I don't like the subject for this topic. Neat idea, great colors, a bit too dark, and some blurring. 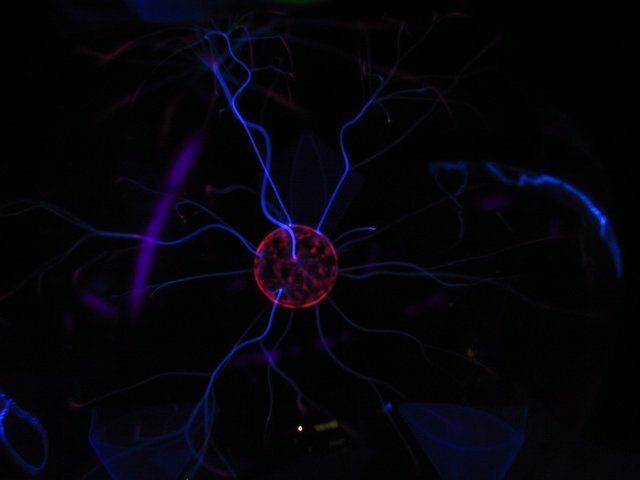 ahh.. a plasma ball. haven't seen that in some time. must've been difficult to get it in stop action with enough light. kudos for hard work. This is a very interesting photo. It would seem that it would be hard to capture the lights on one of these lamps without getting the light trail. You did a very good job. i like these things. did you try juicing up the levels some? Good idea, but its a bit too dark. Maybe having someone touching it on the sides would have helped balance the plasma trails. interesting and original shot much better than the rising bubble pics! Cool subject. Its a bit dark, but a slow shutter speed would've blurred the lights probably. The little yellow light in the bottom center doesn't fit though, is that from the auto focus assist light on your camera? I like the idea, but I think the overall picture is too dark. Centering would have made this image more powerful. I'm impressed that you got them to stay still. :) Perhaps a better centering job would've worked better. Nice color and stop motion. Very tight shot too. I like this. I photographed one of these one time and got similar results. This is a cool photo but I'm not rating it higly on 'stopped motion'. good idea. Colours don't really seem to come up strongly enough though. Proudly hosted by Sargasso Networks. Current Server Time: 04/20/2019 12:38:42 PM EDT.